This is a rough guide to legal issues surrounding home cabling. The material on this page is for information only, Homewired assumes no responsibility for the accuracy of this information or any injury or property damage caused by following any of this information. If you are in doubt about the legality of what you’re doing then get a professional to do it. It should go without saying that you can’t do any electrical wiring yourself, you must use a registered electrical contractor. It is also illegal to install extension cords or power cords as fixed wiring. It is also illegal for home owners to install or modify any cabling that can be connected to a telecommunications network. This includes the telephone line and any extensions that have been installed. It also includes any Cat5 cabling, even if you only intend to use it for an internal network. Unfortunately the law still applies even if the Cat5 cabling is nowhere near any telecommunications cabling or even if your home is connected to the network via optic fibre (which doesn’t conduct electricity) or wireless. If you want an extra phone point or Cat5 cabling installed you must use an ACMA registered installer. Pretty much anything else, provided the voltage is not exceeding 42.4 V peak or 60 V DC. This includes audio visual signal cables including HDMI (which includes a 5V power supply line) and speaker cables and TV antenna cables. Though there are no specific regulations covering this type of cabling in the interests of safety you should follow the same principals of separation of services and health and safety awareness. The number of options for cabling your home are increasing all the time, with so many technologies and connectivity options available it can be difficult to choose the right option for you. In this section I’ll discuss the various options and pros and cons of each. There are several options for broadband internet access now and the best service for you will probably depend on your geographical location. To find the best deal for you I suggest visiting Whirlpool broadband choice. The broadband option you choose may have an impact on how you want to cable your home, for example if you’re going for ADSL then you probably want to have a phone point installed near a power outlet in a central location. You may also want to run Cat5 cabling from the central point to each room in the house. The central point becomes the communications hub for your home, the best location for it may be a study or in the garage. Remember to run a Cat5 cable to your entertainment system or home theater, if you don’t already have broadband enabled devices there you probably will have soon. Home owners in some new estates now have the option of FTTH (fibre to the home). If you’re lucky enough to be one of them you need to give special consideration to the cabling required. In most cases the optic fibre will terminate on an ONT (Optical Network Terminal) that will probably be mounted on the external wall near the electrical switchboard. It may be a difficult job to get additional cabling to this point so if you can get it installed as the house is being built it will be a lot easier. In most cases you will want one coax cable for TV and two Cat5 cables (one for phone and one for internet) between the ONT and the central point. At the central point you will probably have a router of some sort, in the case of FTTH you will have an Ethernet router otherwise it will probably be ADSL. The function of both being similar, they provide a point of authentication with the network usually via PPP (Point-to-Point Protocol) and may perform NAT (Network Address Translation) so that all the devices in your home can share one public IP address. In some cases the router will also include an integrated VoIP (Voice over IP) gateway, this allows you to connect a standard telephone to the router and make calls via the internet. You will need to subscribe to a VoIP service first and configure the router correctly. Note a voice service may also be available from the ONT, this may be a different service to the VoIP service from the router, you need to the compare cost and benefits of each option. The service directly from the ONT may be more reliable than VoIP, for example the ONT should have a battery backup in case the power fails, unless you have your own UPS (Uninterruptible Power Supply) the the router will go off if there’s a power failure. You should decide how important the phone service is to you and whether you have a backup communications option (mobile) in case of emergencies. Ethernet connections are typically made between a computer and a switch (or hub) in this case the cable required is a standard (straight though) cable (usually blue). If you want to connect one switch to another switch or one computer directly to another computer you need a cross over cable (usually red), these cables have the TX and RX pairs reversed. Most broadband routers now come with multiple Ethernet interfaces, effectively they include a built in Ethernet switch. You can connect any computer or Ethernet enabled device directly to the router with a standard (straight though) Cat5e cable. 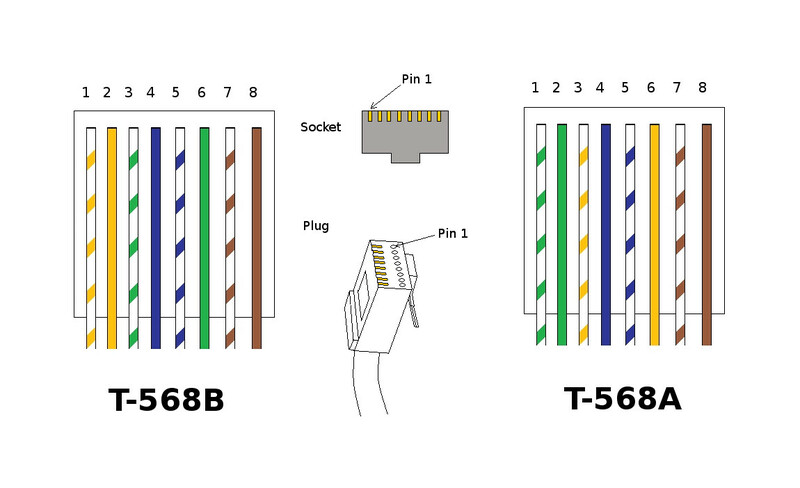 There are two standards for RJ45 wiring T-568A and T-568B though T-568B has become the defacto standard, for example if you buy a pre-made Cat5e/Cat6 cable it will probably be T-568B at both ends. Note a crossover cable is T-568A at one end and T-568B at the other. With the advent of Gigabit Ethernet a feature known as Auto-MDIX was introduced, this allows connections between switches or between computers with any cable type (no more need for cross over cables). Most new computers support this now but most broadband routers still do not. Home entertainment options are also becoming more and more complex and there are many different ways to interconnect modern audio visual devices. In this section I’ll try to explain the interconnection options and the pros and cons of each. Entertainment can now come from a growing number of sources, free to air television and HDTV, cable TV and now more and more content is reaching us via the internet. The options for audio are even more complicated several different ways to connect the same devices. A free to air television antenna should be connected using coaxial cable, the cable should be RG6 type and quad shielded if possible. Older antennas may be connected with 300 Ohm flat pair cable. If you have one of these antennas and want to install an additional TV point you will need to connect to the antenna directly with a balun (not stocked) to convert the signal to unbalanced mode compatible with coax cable. This will cause some loss but should be acceptable in good reception areas. There are two common types of connector used for coax in Australia. The first is the more common PAL type (push in) that has been in use for many years in Australia and Europe. The other type is F-type (screw in) which is a US standard and is more common for pay TV but can also be used for any coax connection. 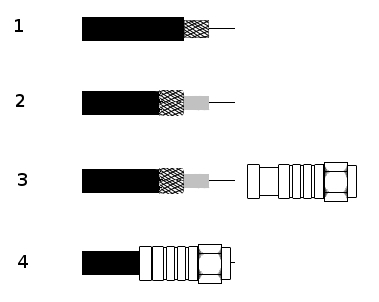 The advantages of the F-type connectors are that they are more secure (screwed in) and the center conductor of the cable is used to connect to the socket. This eliminates the center pin and thus one more possible point of failure, it also minimizes the change in characteristics of the cable which is important for radio frequency signals. If you want to have more than one TV point then you will need a splitter, as the name suggests the splitter splits the signal into 2, 3, 4 or more for distribution throughout the house. It should be noted that it also splits the signal power for example the output power of a two way splitter will be half that of the input. This should only be a factor if the signal strength from the antenna is low. If that’s the case you may need the assistance of a professional installer. Firstly you will need a compression tool and a coax stripper for this job, these are available in our store in the tools category. There are two types of compression connector available, standard or waterproof, the waterproof type require a compatible compression tool that supports the connector 360 degrees around the cable. The compression tools we sell are compatible with waterproof connectors. The first step is to strip the cable, the stripper should be adjusted so that the first blade cuts the braids and foil and cuts most of the way through the dielectric (centre insulator), the second blade should cut the other sheath without damaging the braid. Note – for quad shield cable you may want to remove the connector end and push that over the braid first, otherwise it may be difficult to get the connector on. Step two is to push back the braid over the outer sheath, if using quad shield cable there will be an outer braid, outer foil, inner braid and inner foil. The outer foil may be removed but the inner foil should remain bonded to the dielectric. Step three is to push the connector over the end of the cable, you may need to twist the connector as you do this. Push the connector on until the dielectric is flush with the back of the nut on the connector. The last step is to insert the connector in the compression tool, close the gate and compress the connector until it’s closed. Trim off any excess center conductor so that there is about 1-2mm protruding from the connector. Some of the keystone speaker terminal we sell need to be soldered at the back, you will need a decent soldering iron otherwise you won’t be able to get enough heat in the terminal, here’s a few tips. The trick is to get the heat into the terminal as quickly as possible then apply the solder and remove the heat. If you leave the heat on too long you could melt the plastic. There are many different standards for video connections but I will cover only the most common and relevant standards. HDMI is the most recent standard for video signals and is still under development, it is based on the DVI standard (with additional audio channel) and DVI can be converted to HDMI (minus the audio). HDMI supports high definition video with a built in digital audio channel, there is also an Ethernet channel in HDMI version 1.4. HDMI is the format of choice if your equipment supports it. There’s a lot of hype surrounding HDMI cables and it can be hard to separate the fact from the spin. Yes it’s true that HDMI uses very high data rates and a poor quality cable could cause picture problems especially if the cable is long and there are other components involved (wall plates, switches etc). However as HDMI is a digital signal there should be no degradation in picture quality until the signal quality reaches a point where you notice a significant loss of quality, this is usually seen as “snow” or white speckling on the picture. Anyone who tells you they can see a difference in the picture quality with their $300 1m HDMI cable really has more money than sense. Though there are several standards for HDMI there are currently only two standards for HDMI cables, standard speed and high speed. High speed cables are certified to handle 1080p signals including those at increased color depths and/or increased refresh rates. Cables that are not specified as certified 1.3a and/or high speed have not passed the required testing and may not support full resolution. Certified cables are generally limited to 10m as longer cables will not pass the testing, this doesn’t mean they won’t work at all but may only work reliably at lower resolutions/refresh rates (for example 1080i instead of 1080p). For more information on HDMI visit www.dhmi.org. As previously stated certified HDMI cables have a maximum length of about 10m. You can buy longer cables but they are very expensive and still limited to about 20m. A better alternative is to extend HDMI over Category 5e or Category 6 (Cat5e/Cat6) cables. Both HDMI cables and Cat5e/Cat6 cables use twisted pair (two wires twisted together), the twisting is designed to cancel out interference. HDMI over Cat5e/Cat6 extenders boost the signal and map the twisted pairs of the HDMI cable to the Cat5e/Cat6 cable. There are several types of extenders available some built into wall plates and others stand alone. Y carries luma (brightness) and sync information. PB carries the difference between blue and luma. PR carries the difference between red and luma. There is also another type of composite video known as RGB, though this also uses three RCA cables it is not compatible with YPbPr and requires active electronics to convert the signals. Composite video combines all the video information into one signal and is the most common standard used at the moment due to it’s simplicity, it uses a single RCA cable (Yellow). The combination of all the video information can lead to some degradation in video quality. S-video separates the signal into two components luminance and chrominance (brightness and colour) and uses a round connector with 4 pins. Yes HDMI is also an audio interface, this means that you only really need one cable between your AV receiver and the TV. There is only one problem with this, at the moment the audio channel is only one way so if you want to get surround sound from your HDTV to the AV receiver you will need to add a digital audio cable like a Toslink cable. There are plans to add a reverse audio channel to the HDMI standard in the future, this should work with existing cables. Toslink optical audio is a digital audio interface that uses a optic fibre cable to transmit the audio signal using light. As the optical signal is immune to electrical interference there can be no noise introduced into the signal. The optic fibre cables are actually made of plastic (rather that the glass ones use for Telecommunications) so they’re relatively cheap also. This should be the preferred method of connecting audio equipment. Digital audio uses a single RCA cable (Orange) and is similar to Toslink, this is also an acceptable alternative to optical audio. The humble stereo audio signal uses two RCA coaxial cables (Red and White). 2. Cut out the hole with a plaster saw, cut two V’s in either side for the screws. 3. Pass the c-clip through the hole and clip it on to the edge of the hole so that the screw holes line up with the V’s you cut in the sides. Make sure the screw holes are clear otherwise you’ll have trouble fitting the screws. 4. Screw on the backing plate (for the screwless type plates you may need to push firmly either side to push the screws that hold the center part into the plaster so it sits flush with the wall). 5. Fit the outer cover. Getting cables though the walls of your home can be a little tricky, here are a few tips to help make it easier. Firstly running cables in you home and working in the roof can be dangerous to the DIY cabler and also may create safety hazards for other people in the future. Always consider the safety issues surrounding a job carefully before starting work, if you have any concerns about the safety of what you’re doing get a professional to do it. The most obvious safety risk associated with cabling in the home is the presence of electrical wiring in the walls and roof. Firstly you should confirm that your home is fitted with an electrical safety switch, all new homes are now required by law to have one fitted, if your home does not have one then we recommend you contact a registered electrical contractor and have one installed before doing anything else. A safety switch will detect a fault by comparing the current flow in the active and neutral wires of the electrical supply. Any difference in the current indicates a leakage from the electrical circuit to earth (possibly flowing through a human body) and the safety switch cuts off the power supply before any damage can be done. Though a safety switch should save your life in the event that you come in contact with electrical wiring it’s best not to test it. The safest thing is to turn off the power at the main switch before starting work, don’t just isolate the circuit you think is the one you are working near as it’s too easy to turn off the wrong circuit. If you need to use mains power tools then you should take extra care to avoid any wiring. Before cutting or drilling into a wall take a look around for any power points and electrical fittings near by (check both sides of the wall if appropriate). The electrical wiring should run from the outlet or fitting up the wall to the roof but may not be in direct line with the outlet. Some stud finders have a wiring detection function, these only work if there is current flowing though the wire so you need to use them before turning the power off and supply a load (eg. plug a lamp into the power point and turn it on). In any case you shouldn’t trust these devices 100%, always turn the power off. Always make sure the ladder you’re using is sturdy, in good condition and properly suited to the job, have somebody hold the ladder for you when climbing onto or off the roof. If you have mud on your shoes make sure you scrape the mud off before climbing the ladder or onto the roof. Working in the roof of a house can be very hot even on mildly warm days, always make sure you drink plenty of water, if you feel sick or weak or have a headache you should stop work immediately and cool down. TIP: you can usually open some tiles in the roof (if they’re not nailed or wired down) from the inside, this will help cool air flow though the roof while your working there, this also allows you to see a lot better, just remember to close them again when you finish. Firstly you should think through and plan where you are going to run your cables before starting work, take into account where devices will be mounted and what obstructions might be in the way, you don’t want to have to patch up holes in the plaster because you put something in the wrong place. Once you have identified where the cables are going to run and identified where any electrical wiring is you need to get the cables into the wall. Use a stud finder to locate the studs near where the cable will run, putting the wall plate or outlet near a stud might make it easier for you to get the cable down the wall. Keep a minimum distance of 150mm from any power outlet or fitting, the cable must not run within 50mm of any electrical wiring in the wall. Cut a rectangular hole in the plaster where the wall plate will be fixed, you can use a plaster saw for this or a sharp knife. If running the cable through the roof then you will need to be able to find the exact point directly above the hole. The best way to do this is to measure from the center of the hole to a fixed point in the room, an outside wall is the best thing otherwise measure to another wall that can be easily identified. Take note of the buildings features before climbing up into the roof (things look a lot different up there). Once you have identified the correct wall in the roof you need to drill a hole in the top plate (wooden beam that forms the top of the wall). Measure from the same point (eg outside wall) to find the point directly above the hole you made. You should be able to see where the studs are, look for the nails. Once you have drilled the hole you will need to drop something down to pull the cable through. The best tool for this is “yellow tongue”, this is the tongue from tongue and grove flooring and is perfect for getting cables through the wall. You may be able to get some for free if you know someone in the building trade or ask at the hardware store, otherwise you can buy some. Drop the yellow tongue straight down the wall cavity (as straight as possible) on one side of the wall or the other, in most new homes there is a cm or so gap between the plaster and the noggins that you must get the tongue through. If you home is an older building then there may be no gap between the noggins and the plaster, or the cable you are running may be too big to fit past the noggin. In this case you will need to drill though the noggin using a drill bit on an extension. This can get a little tricky and expensive if you need to buy the extensions. Getting the yellow tongue through the second hole can be very challenging. TIP: drill a second hole in the top plate so you can shine a torch down. Once you have the yellow tongue down the wall go down and look through the hole to see if you can find it. If you have measured accurately (or are very lucky) it will be right there (get a torch and have a good look around). If not you will need to do some fishing, for this I recommend some plastic coated gardening wire. Only use plastic coated wire (for insulation) and make sure you tape up the end so you can’t come in contract with the bare wire, of course the power should be turned off but this is an extra precaution. Make a hook from the wire and start fishing around for the tongue. When you have found the tongue you can then push it up the wall until you see the end, then guide it though the hole. Now you have the tongue through the wall you can either tape the cable directly to the end of the tongue and pull it through or tape some sturdy string to the tongue and pull that through. You can then use the string to pull through several cables (TIP: tape the cable to a knot in the string and pull some string though with the cable, that you you can pull the string back though later), you can even leave the string in the wall in case you need to pull more cables through some other time. If you need to get cables down an external wall to the outside of the house then it’s going to be a little more difficult. Firstly drill through the mortar between the bricks and open up the hole so it’s a few cm wide. Then you need to take some tiles off the roof and push down the yellow tongue. You won’t be able to get the yellow tongue through the hole so tape a loop of string to the end of the tongue with a small amount of tape (so that the loop can be pulled off). Then get someone to help you with hooking that loop with some wire as it’s near the hole in the brick work. It might take a while to get the loop in the right position and it might be hard to get the tongue down if there is a lot of excess mortar in the cavity. When running cables in the roof they do not need to be fixed but should be out of the way and not present a tripping hazard. You should maintain at least 50mm space between any cable and power cables or pipes, if this is not possible there must be a durable barrier in between. If you must run the cable across a power cable you can run it through a short length of flexible conduit where it crosses the power cable or pipe, tape the conduit to the power cable to keep it in place. If you are only running cables up the wall to a wall mounted television then your job should be easier. There are however some additional considerations. Before mounting any wall plates or making any holes mount the wall bracket first or mount it temporarily and mark where the holes and edges are, that way you won’t put the wall plates in the wrong place. Be careful to make sure you have the bolts in the center of the studs (big screens can be heavy). Mark the center line of the stud and confirm you have the center by probing either side with a short nail. You may need to run several cables to the screen so it may not be possible to get all of them past the noggin, at best it will make it difficult to get the cables through. You should be able to identify where the noggin is with a stud finder. It may be possible to mount the wall plate/s below the bracket (but still behind the screen) in such a way that it’s below the noggin. Otherwise if you put the wall plates just above the noggin you may be able to drill through it on an angle. If not you may need to cut a large hole in the plaster so you can drill straight through the noggin and patch it up (it should be covered by the screen anyway). Due to wiring rules it is illegal to run a power cord or extension cord through the wall, for this the best option is to have a power point installed behind the screen.